Pre-Tour favorite clenbuterol-positive Alberto Contador finished Stage 2 in 75th place, 1:42 back from the leader, which makes me happy. Naturally he and the team aren't happy with that result, so they're asking for the rules to be retroactively changed in their favor. Should Wim Vansevenant be worried? 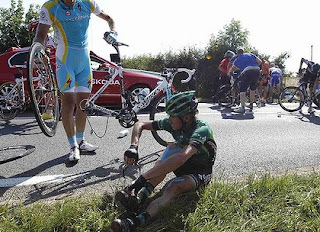 Is the Tour de France too hard?